For years, MEDA has prioritized service integration across the agency, as it increases the success rate of clients by coordinating all of the programs they access. MEDA has implemented a robust referral system for MEDA’s internal programs and external partners through the launching of a customized Salesforce database. In addition, Financial Capability was fully integrated into all of our services, as research has shown that clients are three times more likely to improve their credit, savings, income or debt if they participate in multiple asset development services. 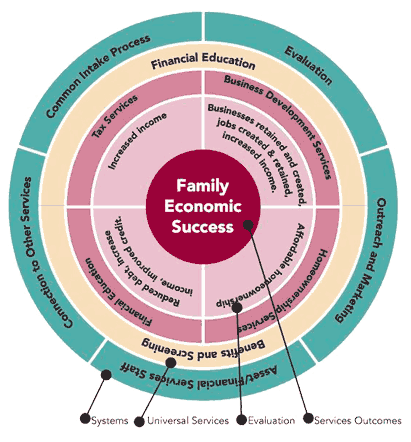 Every family at MEDA now receives financial coaching and screening for public benefits, plus they can easily access multiple services within the agency and at many other community-based organizations. At MEDA, we provide families with the full scope of services they need –- both inside and outside of MEDA — that when “bundled” together, result in long-term financial stability.